Cavachon and Cavapoo owners write reviews and letters of thanks and even send photos of our Cavapoo and Cavachon puppies all grown up, as well as thanks from our friends and tales of their exploits and adventures. Looking for reviews and testimonies for our Cavapoo and Cavachon puppies? Here are a few of the most recent letters and "reviews" from our past amazing Puppy People and their adorable Foxglove puppies! My Inbox is a delight, with stories and photos of my puppy kids and tales of them doing the job I raise each of them to do, BRING PUPPY JOY! I always say that I have the BEST Puppy People on the planet and I am grateful for each one of you. (Don't miss this first letter from Brenda Davis, amazing to see Jack & Lily this past Christmas still as adorable and loving as they were when she picked them up at Foxglove Farm over TEN YEARS AGO! What a blessing to be part of their journey of being exceedingly faithful & loving companions for so many years!!!" Jack and Rosebud wish you and your family a very Merry Christmas and a very Happy and Healthy New Year. These 2 little bundles of love have given me (and all who meet them) so much joy. Can’t believe they will be 9 and 10 years old in 2018. It seems like yesterday I drove to your house, met you and my sweet boy Jack. He is the sweetest, smartest, and most loyal dog I have ever had. Miss Rosebud is still as sassy and loveable as ever. She is totally a mama’s girl and enjoys sleeping on my head every night!!!! Yes, they are both very spoiled and they sleep in my bed. Jack prefers to sleep under the covers and spoons with me and Rosebud sleep on a pillow above my head. What a gift they continue to be and I give thanks for the day our paths crossed. Please continue to breed these wonderful dogs because I know the day will come that I will be putting my name on your waiting listing. Did you think we had dropped off the earth? All is well with the Griffin family including our little Princess Boo. I can't believe it's been five months since we picked her up from the airport. I hope all is well with you and your family. Did you have a crazy cold winter there? Boo is absolutely the most precious little girl and we can't imagine life without her. She has such a big personality - she's actually more human than dog. She charms everyone who meets her - all 6.5 pounds of her. She has her routine down and we have all been trained to go along with it. She is now sleeping with mom and dad - and she REALLY likes sleeping there - so she gets up in the morning when dad coaxes her out from under the covers. She plays "G.I. Boo" as Mike calls her by lying flat and dragging herself along the sheets with her front legs. She's just taking as long as possible to get out of bed. She then has her Fiber One cereal and yogurt with mom. She likes Fiber One better than any human. After breakfast it's time to play until brother Brian comes down, then it's time to act crazy with him. Of course, she has to get the mail out of the mail slot before mom and run through the house dancing with it. Around 11:00, her BIG friend Bo (who is a giant Goldendoodle weighing 150 pounds) comes to the door to say "Hello" to Boo. His mom walks him (without a leash) every morning and Boo goes crazy when he comes to see her. When they are outside together Boo stands on her back legs and jumps up and down but she doesn't even come close to touching his chin. They romp around the yard until the moms split them up. Boo has no idea she's not as big as Bo. At noon, Mike comes home for lunch and she announces his arrival until I open the back door so she can run out to meet him. Then it's play time again with dad! After he leaves, it's time for a nap in the sun on the rug in front of the door. After nap she gets a short walk in the park (weather permitting). Then comes the best time of the day - dinner! Boo loves raw zucchini, carrots, sweet potatoes, broccoli and green beans. And she loves chicken and steak, but her most favorite thing in the world is PASTA! When she sees the big pot come out of the cabinet she starts her happy dance because pasta is just a few minutes away. I always put her dinner on a small saucer. We have now realized she knows the difference in the sound of a dinner plate and saucer coming out of the cabinet. The saucer makes a higher pitched "clink" sound. So if you get a dinner plate out, no big deal. However, if you happen to get out a saucer Boo will come running from wherever she is in the house because she thinks it will be for her. We now call saucers "Boo Plate Specials". And we never use a saucer unless it's for her. After dinner it's time for some quiet play and then a little nap before going to bed. So at 10:30 it's outside for potty. Then she runs to the cabinet to make sure Mike makes her peanut butter Kong. Once she has supervised that she runs to the bottom of the stairs and waits (impatiently) for him to carry her upstairs. He puts her Kong on a blanket on the floor in our room where she laps up her peanut butter. Then she runs across the hall and pushes on Brian's bedroom door until it opens so she can tell him good night. After she has kissed him several times she runs in the bathroom where I am washing my face to say "hurry up!" Then it's back in the bedroom so Mike can put her in bed where they play "Attack the Hand Under the Covers" until mean mom comes in and says, "Lights Out!" She snuggles right next to one of us and goes to sleep and we don't even know she's in the bed. As you can tell, Boo is pretty much never alone. And she goes with us just about everywhere we go. We've been working on a house in Tulsa (where our daughter used to live) trying to get it ready to sell. Boo just thinks it's a big empty carpeted playing field where she can run and romp and have a great time. We found some wigs out in the garage and let Boo play with them. That was a fun sight to watch. We are expecting our first grandchild (boy) in 3 weeks. We wondered about Boo but she loves small children so much that we are certain she will love the baby and be so gentle with him. I did a test, though, by taking food out of her mouth to see if she would growl, snap, anything. And she did nothing which is wonderful. That let's me know she won't get upset with a toddler eating her food. We had to have 7 of her baby teeth pulled a few weeks ago. Her baby teeth didn't fall out and so she looked really mean having a double row of teeth. She did fine and was no worse for the wear, but mom and dad aged a lot while waiting for her to finish. We sometimes think we should get another baby for Boo to have someone with 4 legs to play with but she seems pretty happy so far with her 2-legged family. Maybe one day you with post another black puppy picture and we will have to have another. But for now Boo is filling our hearts to over full! Thanks again for sending us such a precious bundle! Boo now weighs a whopping 7 pounds (too much pasta) and she has learned to go up and down the stairs! She looks like a tiny rocking horse going back and forth to go up and down -- both feet stay together on both front and back so it's a cute little rocking motion up and down. I guess I stayed upstairs just a bit too long one day so she finally gathered up her courage and up she came! She about scared the life out of me when I turned around and there she was. Now she's a little speedster jetting up and down. Her ability to climb them has caused Mike some grief. Now, after he takes her out in the morning, she flies back up the stairs to see if I will put her back in bed. Mike says she's too fast for him to stop her. Terry, your commitment to raising these special little babies, and the wonderful instructions and advice you send with them, make having one of your puppies a total joy. Boo is very smart and easy to train, she is loving and gentle, yet she can be a wild child and play hard when she wants. She is a great companion and she only barks when she needs to go outside or when something is not quite right. If a car should park in front of the house, she lets us know that something is different. Or if we're upstairs and she hears a sound that's not normal, she lets us know. It's uncanny how she just wants to alert us to anything that she thinks we should know. I really appreciate that in her because I have lost so much of my hearing and she hears a lot of things I do not. It's very comforting having her in the house. I loved looking at the new babies today and so loved the Fixer Upper theme. We love Chip and Joanna, too. Some day we may have to get another baby to keep Boo company, but we are perfectly happy with our sweet little Boo for now! First let me apologize for taking FOREVER to write to you about our dog. It was a great surprise to our children! They still talk about being so excited about having a dog in their house that is theirs! We decided to name him Max because that was the Grinch's dog's name and we got him for Christmas. He is doing good. Right now we are on a 6 week trip in a motorhome going from South Carolina to California and stopping in between! We were worried about taking him because we didn't know how he would do and a friend offered to keep him but he is with us. He has been doing great! I have sent a couple of pictures of him - one at our home, one of him driving to see some friends in Oklahoma and one of him with my 3 children in Utah (Zion National Park). Thank you again for all the help you gave me when I was buying our dog! You were a huge help and such a pleasure to work with. You helped us get a great dog for our family. He is a very sweet dog that has fit in with our family wonderful! Did I say Cavachons love the water? Here are Hannah & Woodstock Shields helping navagiate! How cute!!! HER, AND WE ARE SO VERY HAPPY TO HAVE THIS SWEET GIRL IN OUR FAMILY. WE STAY UNTIL BUSINESS IS DONE. DIDN'T HAVE THE HEART TO CALL HER OUT ON IT. ALMOST. WE HAVE A FABULOUS CHARACTER AND A WONDERFUL BUDDY FOR SWEET BRIAR. THE PUPS ARE THICK AS THIEVES AND WE ARE ALL BEYOND DELIGHTED. I HOPE ALL IS WELL WITH YOU IN PUPPYVILLE. THANK YOU AGAIN FOR THIS SWEETIE. Terry, as promised, some pics. he is potty trained and knows 6 commands already very well. Joyous love. All day. Which is why we can't wait for our 2nd baby to arrive from you soon! Paddy will be a big brother! His first camping trip to the Smokies and he loved it! His hunter Spaniel Nose found turtles, frogs, and other "real doggy" fun in mud and streams. A quick dip in a warm sink with suds and he's a happy camper! Dear dear Terry...i'm grateful everyday for Lily and i often think of when i was led to you (7 and 1/2 years ago)and was united with my sweet Lily. Once again , thank you for your beautiful work. You have been led to start these beautiful little creatures on their way to loving their families in their miraculous way. I do believe she is a special gift in my life. She has the sweetest little heart and i am so blessed to spend everyday with her. I wish I could ((( HUG))) you! Cody, is by far, the best dog I have ever had and that is saying a lot! He is intelligent, playful, affectionate and so darn cute! He does not realize he is only 3 pounds- he is a Big Boy! He has been such wonderful company for me and has been so great for helping me transition into the next chapter of my life. I have never bought a dog without seeing him but my friend just did and it worked out beautifully. I went through your website and saw all the happy reviews so I felt confident. I hope this email finds you well. Blake is everything you said. He is a wonderful dog and has a great temperament. I was very skeptical about getting a dog without seeing him, but I had an instinct, (Along with some major research) and had I had flown out there, I would have picked him anyway! You were right about Cavachons loving the water. I took Blake to Malibu, and we spent two days at my friends. I thought he was going to hate it as the ocean is kind of strong there. The first thing he did was walk straight into the ocean. I am attaching photos. He had a ball. I am taking him again this week. (So many of our Puppy People end up getting a second (or 3rd!) puppy from Foxglove Farm. Here's too cute for word "Wesley" napping with "Winston" Heather Andersons' FIRST & SECOND Foxglove kids! Greetings from Nashville! I wanted to update you on Bexley. We moved from Ohio to TN last spring. Bexley just had his 10th birthday and still has his puppy spirit. People are floored when they learn he's 10. He has never had a heath problem and is as sweet as ever! He is such a good dog, I wonder at times what I did to deserve such a companion. Hope you are well! We promised you some skyline pictures so here you go! Bowie is right at home here in the Big Apple. We can't imagine our family without him! He is truly the most amazing loving sweet well tempered little guy. He is the perfect balance of active, fun and cuddly. He has a huge love tank and loves nothing more than to snuggle in our laps at the end of the day. If the whole family is sitting together, he takes turns plopping down into each of our laps so as not to leave anyone out. We have managed to teach him excellent manners (along with a wonderful trainer) so he knows never to exit an elevator or go through a doorway without us telling him to first, and he sits down and waits patiently whenever he greets people or even other dogs. He LOVES being groomed and jumps for joy whenever he sees me take out his brush. Our groomer told us that he is a pure joy to groom and she has never had such a pleasant experience with a six month old puppy! Last but not least, he is terribly handsome with the softest white coat (our neighbor calls him 'cashmere') and perfectly placed apricot spots. We just adore him! I have attached a recent picture of him with the kids. I see such gorgeous pups on you website! Everyone should know what a great job you do with these beautiful puppies and how blessed we are to be their puppy parents. You are the best! Wish I could buy 3 more but Carter fills our hearts with such joy everyday that we are content with just one amazing Cavapoochon. I noticed that the girls seem to go first but to all of your clients, let me say that the boys are such lovers ....never hesitate to bring a boy into your home and into to hearts, you won't be disappointed.!!!! I swear he was sent from Heaven Terry. He is soooo good. He is the talk of the neighborhood. 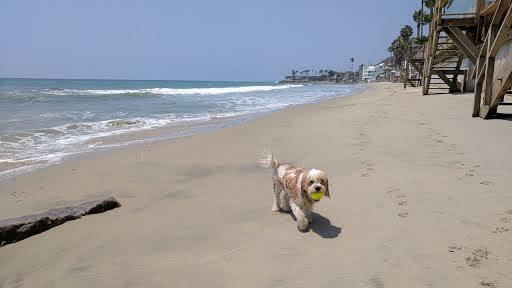 Here's Bruno enjoying his new wheels on Huntington Beach in California! Thanks for sharing your adorable little guy Dan! I just thought I'd send you a picture of Ruby Slippers at 1 1/2 yrs old. She is ADORABLE, very sweet and a bundle of energy. Hi Terry, We can't wait for Schooner's arrival, here's Ollie is at the beach with us and 12 children and grands. He is the center of attention...of course and having a ball! Thank you, Terry! Love this post......everyone should know what a great job you do with these beautiful puppies and how blessed we are to be their puppy parents. (Dear Puppy People, Sharon is referring to my blog post about Carter's birthday on our Letters From Foxglove Farm site, you can read it here, I LOVE sharing our babies all grown up and having adventures in their new homes). Abigail Brown waiting for Santa! Gatsby says hi from her NYC penthouse! All of Broadway adores her! (He's not kidding puppy people! I recieved a photo recently of Gatsby at an event with Marlo Thomas and her husband Phil Donahue. Little Gatsby was happily snuggled in their arms enjoying being the "star" of the part! Yesterday my husband and I went to our favorite Italian Restaurant in Lakeland, Florida. I'm guessing you may have already heard this story & seen a picture! Anyway, we always take our wonderful cavachon, Dudley, with us and dine on the patio. All the waiters know us and our dog. We've spoken with Manuela & Gianni Schiano several times, but yesterday they had their dog with them. She was so cute & sweet. I heard Gianni say to someone that she was a cavapoo. As we were leaving I asked where they got her & then we found out we both had one of your beloved babies!! So surprising and so exciting! We actually live in a very small town just outside Lakeland, Polk City, so everything we do is in Lakeland, which is still not a large city. It is safe to say we never expected to find another of your wonderful dogs here in Lakeland. It is a small, small world! Since I'm writing I must take a minute to tell you about our adorable four-legged baby, Dudley. (The picture below might remind you of our little guy.) He was born July 27, 2011, named Trick or Treat. He was heaven sent to us on October 28th. I wrote you soon after & shared how my father, to whom I was a caregiver, died suddenly 2 days later. I was devastated, but our brand new puppy gave me laughs between the tears. Now Dudley is heading toward his 5th birthday. (Below, a recent picture of him in his car seat.) He is a sweet, friendly, intelligent, well-mannered, constant companion. In our large over 55 community everyone knows & loves Dudley. He also goes with us daily to an Assisted Living Facility, bringing joy to my 100 year old mother-in-law & smiles to the other residents. Should we make a stop without Dudley we are instantly chastised by residents and staff! Dudley makes us laugh every day. He loves to play during the day and snuggle in the evening. We think Dudley is the perfect dog and we give thanks daily for having him in our lives. We also thank you for your care in breeding such wonderful dogs. I don't have email for Manuela or Gianni. I know they did make a picture of both dogs which I'd love to see. Anyway, feel free to share are our email with them if you want. I've attached the Angel Photo of Gabe, however the wings don't show up too well in the copy. They were attached with the white ribbon wrapped around him,.and looked ethereal in the original photo. It's a great photo of what a five year old Cavachon from Foxglove looks like. He'll be eight next month and is still just as handsome. Many thanks to you for my little companion. I love him to the moon and back. The pansies on your blog are so colorful and beautiful. I hope that things are going well with your mother. I keep you and her in my prayers. Terry, She really is the MOST OUTSTANDING dog!!! She is as naughty as they come, but has the face of an angel and all she wants 24/7 is a tummy rub. If you go over to pet her, she rolls over on her back WE ABSOLUTELY LOVE HER!!! Everything is going great! I think Orange Crush or 'Ragnar' as we now call him has been loved and spoiled to pieces. He is named after my sons favorite viking warrior. Seems appropriate don't you think? (Not) Ha Ha. Our cat is not a fan, but she tolerates him. Luckily Ragnar does not persist when she hisses, and he just leaves her alone. (; We are very new to the puppy training thing, and I am trying my hardest to make sure I am doing everything just right. Your blog his very helpful, and I also ordered the book you suggested. I have a lot to learn! He is sitting on my lap right now. He truly is the sweetest thing. It's funny how you end up at certain places in your life. I saw a video on-line of a Cavachon puppy and wondered, "What is a Cavachon?" I hadn't heard of the breed, so I googled it. It took me the Foxglove Designer Puppies website. After reading a bit about them, I clicked on the "Available Puppies" tab and there she was. This adorable little face that just spoke to me through the screen. I knew I just had to have her. I started working on my husband, who DID not want another dog (we had 2 boxers at the time). I finally won his approval and we went to get her. Now here's the funny part, instantly my husband took to her and fell head-over-heals in love with her. We both did. But, who wouldn't. She is unlike any other dog I have ever known. She has it all. She let's you hold her like a baby and will actually sleep this way, her tail wags non-stop (even in her sleep at times), she's wicked smart and was potty trained and learned all of her tricks almost immediately. But what I love most are her endearing eyes that is a gateway to her warm and loving personality. Looking back over the past 2-1/2 years, she has enriched and enhanced our lives so immensely. I can't imagine our lives without her. She IS our four-legged daughter. She goes to work with us each day, travels on the plane with us when we go to our Florida home, and everything in between. We adore her! I used to think we got soooooo lucky (which I still believe), but my parents now have Callie's cousin and he is proving that it's not just Callie, there is something very special about the breed and about the way Foxglove handles these precious little bundles before they find their forever home. So, thank you Terry! We are blessed! I thought I would send you some pictures of Callie over time. I will send several different messages for space purposes and will send a few videos of her tricks. Feel free to use any of these as proof of this breed's wonderful qualities and beauty. (Dear Puppy People, Here's the darling video of Callie going through her amazing routine of tricks, the one of her being a grizzly bear is priceless! Too adorable not to share! I just want to take a minute to tell you again how special Simon is. He's such a sweet, affectionate, calm, and loving puppy! And he's already taken to structure with bed time and potty training. Only one accident in the house and that was when he was with my boys! Also, he's a great follower on the leash. A walk around the block and he's panting and ready for a nap. So cute! Of course we get stopped everywhere we go so people can pet and admire him. We are so happy that ours is the home for precious Barkley. Here's a photo of his first swimming lesson at Pleasant Hill. We are so glad he is a part of our family. I also love what you posted on the website. Brought me to tears. I truly believe he was waiting for us. The boys love him and will enjoy watching them grow up together. You have no idea what Blessing your California Girls are. Thank you a million times for giving them the best start in their puppy life and picking the perfect puppies for us. They were with mom and I all day running all about and were PERFECT ANGELS! We Love You! "God's Blessings"
Lilly Get's A New Do! Lizzy had her first grooming today! Isn't she adorable? and she loves me back. to produce such a fabulous companion for me. We cannot thank you enough for Snow Bunny (now Zoey). She has integrated beautifully into our family and is a source of joy everyday. Kudos to you for terrific crate training - she arrived that way and to date makes zero fuss with her crate and is already 90% house trained in the span of a few short weeks since we have had her. She accompanied me to the Caribbean a couple of weeks ago and was awesome to travel (in cabin) with. Just as your site says - she thinks everyone she passes by has come to meet specifically with her - he has a super personality and everyone in the family loves something different about her. She just has so much to offer and a massive fan following already. What can I say - Thank you for Zoey and for your continued support and responsiveness on numerous topics/questions that I have solicited your advice. We have Benji! He is adorable and everyone is in love! He is so playful and happy. We've attached a picture of the girls with their new love. Thanks again. We love him so! Buddy graduated from his puppy class yesterday, can you believe Buddy has been with us for 2 months now? He is doing great and we love him more every day. He really is a good boy and perfect match for our family. I told my husband I don't think he's a lap dog, he's a shoulder dog because he'd rather lay on us with his head over our shoulder than curl up on our lap. He's still a puppy & has tons of energy, and he & Drew run in the backyard often. We're only a few blocks from Drew's school, so we walk and Buddy loves to go with us. He is so well behaved even in the chaos when they all get out in the afternoon. He tries to say hi to everyone he sees, but will stay focused when walking on a leash. We still have so many people ask what kind of dog he is and tell us how cute he is. Bailey is just a joy! She is turning out to be MY little best friend and is with me for most of the day...and sleeps with me at night...I just LOVE her!! By the way, I have had 4 friends inquire seriously about your pups!!! 2 are from the WV and PA areas. The other 2 are from here in AZ. I highly recommended you!! Oh she is so sweet and smart she has not had any accidents in the house. She knows what to do when I tell her to go potty. She runs around in fast circles. She has so much energy and goes from toy to toy. She is trying to play with my cockapoo but Lola is a little sad about the new cute puppy. I think they will get along great eventually. Ruby went to the vet today and did great she is tiny - only 3 1/2 pounds. No wonder her xxsmall coat is a little big. She is eating a ton so she should grow fast. She loves her drops and the vitamin wafers. Here is a picture of her in a sweater that is too big. I wanted to send you pictures of Higgins, now her name is Daisy. She is 3 years old now and the best dog ever!!!! As you can see, she loves the outdoors and so do we. She goes camping every years with us and hiking year round. She is the smartest and sweetest dog I've ever met! She understands at least 50 words!! I can walk her off a leash because she listens so well. Everyone that meets her loves her. Thanks for such a great puppy! I would just like to tell you how wonderful Loukas is. He has become a great addition to our family. He is now about 8 pounds and is so healthy. He has an amazing energy that everyone falls in love with. I would highly recommend you as a breeder anytime. You raise such beautiful puppies. Bailey is just a joy! She is turning out to be MY little best friend and is with me for most of the day...and sleeps with me at night...I just LOVE her!! By the way, I have had 4 friends inquire seriously about your pups!!! 2 are from the WV and PA areas. The other 2 are from here in AZ. I highly recommended you! !